It doesn’t take much to encourage me to make cakes. Currently, the market is flooded with baking books, some written by professional bakers and others by well known ‘professional’ home bakers like Mary Berry. And then there is a whole shelf of baking books written by Great British Bake Off finalists like Jo Wheatley, Edd Kimber and Ruth Clemens. I already have a lot of baking books but I wasn't going pass on the chance to review another book about cakes. 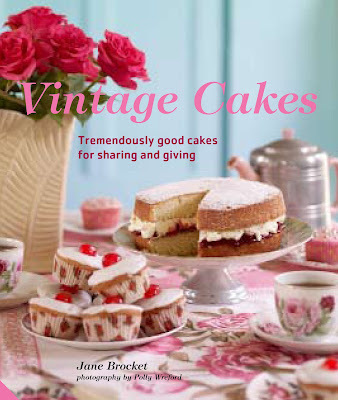 Jane Brocket, the author of Vintage Cakes, is also the successful author of 'The Gentle Art of Domesticity' and 'Cherry Cake and Ginger Beer'. Both books include recipes for favourite family treats and old fashioned cakes. The book starts with some 'essential' chapters. Essential ingredients; this provides a comprehensive guide to the most common ingredients used in baking. This is followed by an equally comprehensive chapter about Essential equipment. This isn’t a huge list of expensive kit, it’s a useful checklist with a caveat that you can ‘use what you have’ and adapt! In Essential techniques the author covers everything from oven temperature, through sifting, and testing for doneness. These are a real boon for new or inexperienced bakers and even experienced bakers can learn from the information in these three chapters. The chapters are organised by the type of cake, I think this is really useful as most bakers have a purpose in mind when they want to bake. There is an index at the back if you are looking for something in particular. Who is Vintage Cakes for? This is a book for home bakers who want recipes that have been perfected over time. All the recipes can all be made with basic baking skills, so it is ideal for someone who is new to baking or for someone who has a little experience and wants to make a range of homely comforting bakes. The introductory chapters are well written and full of useful information. There are cook’s tips throughout the book and each recipe has information about how to store the cake and how long it is likely to keep. There are enough ‘different’ recipes to keep an experienced baker interested. If you baked your way through every recipe in this book, you would cover wide range of techniques and have a repertoire of cakes that would make your Granny proud! Even with 40 years of experience of baking, I found recipes I would like to bake and some I would like to revisit. A 23cm springform tin or round loose-bottomed cake tin, greased with butter and base lined with baking parchment. Start by zesting the 3 lemons, and squeezing one to obtain half its juice. Set aside until needed. Put the butter and sugar in a large mixing bowl. With a wooden spoon or an electric whisk, cream them together until they are pale and fluffy. Add the eggs one by one, beating well after each addition. Add the ground almonds, polenta, baking powder, salt and lemon juice and zest. With a large metal spoon or flexible spatula, mix well until all the ingredients are combined. Spoon into the prepared tin and level the surface with the back of the spoon or spatula. Bake in the preheated oven for 45-50 minutes until the cake is golden brown and pulling away from the sides of the tin and a metal skewer or sharp knife inserted into the centre comes out clean. Transfer to a wire rack and leave to cool for 10 minutes before turning out of the tin. Serve with creamy yogurt or mascarpone, and a glass of something nice and chilled. 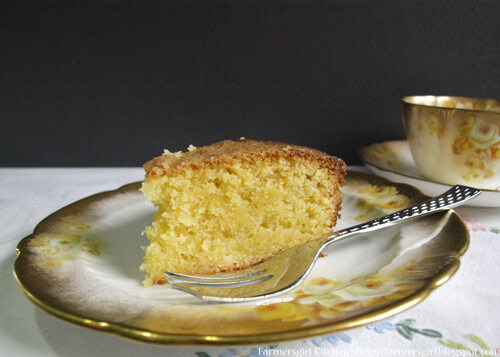 Polenta cake is also delicious with a light tea such as Darjeeling. STORAGE: Polenta cake keeps well for up to 3 days if wrapped in aluminium foil and stored in an airtight tin in a cool place. 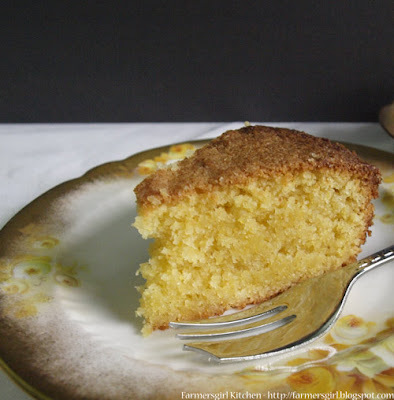 What a fantastic cake, it's moist, with a lemony tang and a lovely grainy texture from the almonds and polenta. I have no doubt I will make this cake again. I didn't want to make a big cake, so halved the ingredients and made it in a small pie tin, it behaved beautifully. I sliced it up and froze most of it, so it will be interesting to see what it is like when it thaws. It would make a great dessert cake, served warm with cream or ice cream. The giveaway will close at 7pm on Saturday 3rd November 2012. This giveaway is open to those with a UK residence address only. The winner will be chosen by Random Number Generator and the blog owner's decision will be final. 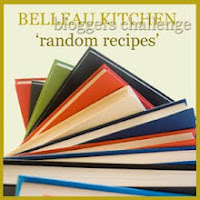 I'm entering the Polenta Cake for the October Random Recipe Challenge. Dom at Belleau Kitchen challenged us to put our hands in the cupboard and pull out something we hadn't used, then look through some cookbooks till we found one which had a recipe for that ingredient and to make it. My ingredient was Polenta, I bought the pack in the summer, but have never got around to making anything with it. I took a pile of cookbooks including those I had been sent for review and, hey presto, Polenta Cake! Never thought to make cake with polenta! Have to try that!! And the Genoa Cake Maggie mentioned... I have golden syrup just begging me to use it. I'd have to say the cakes that have the best childhood memories for me are the teddy bear and bunny birthday cakes my mom made for my sister and I, using tin cans to make smaller cakes for the arms and legs. Mine was always a chocolate bear... hers was always a white cake bunny. Haha! My mum's chocolate cake. She's been making it the same way ever since I can remember. My mum's chocolate cake with melted chocolate and crumbled up Flake on the top. Nice review Janice. I like the way you've ended with the pros and cons, a good tip which I might, if I ever get organised enough, emulate. Your polenta cake looks lovely and light and sounds delicious too. Rock cakes were my mother's go to bake and that's what makes me feel warm and cosy. very sensible comments;) And the polenta cake looks yum! I love the recipe, some of the ingredients are hard to find here in Eastern Europe but...I could improvise...I love your photos, your arrangements...they are so inviting :). Sounds like a great book to me. I think I'd get it even if I do have the recipes elsewhere. The simple Victoria sponge makes me thing of home. Every birthday me and my sisters would get a different flavoured cake depending on our whims at the time. A slice of Victoria sponge takes me back every time. Fairy cakes with dolly mixtures on top take me back to my childhood! 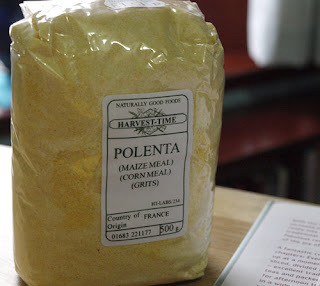 Great review - I am very interested in using polenta after reading the recipe. Childhood memories - I am torn between home made ginger cake and fruit cake which was homemade from the shop opposite. It was very dark like an xmas cake.My dad used to have it with butter but the rest of us ate it plain. Sounds like a lovely book Janice. I like the idea of the cakes being organised by type, as you say generally before you bake you already have an idea of the type of baking you want to do. I think of Chocolate cake decorated with chocolate buttons. Am I allowed to say my Mum's Christmas cake? That has the best memories for me. We didn't have an awful lot of cake otherwise I don't think. More traybakes and truffles and things like that were made at home. Here is the link to the polenta cake I was telling you about with the grapes. It was beautiful. Recipe in the post. for me it has to be Lardy cake. My nan used to make it and I've never tasted anything so good. It was sweet, sticky and so delicious. That polenta cake looks lovely, I've never tried one before so will have to give it a go at some point. The cakes I remember from my childhood are the birthday cakes my Mum used to make for me. Also my Grandma's fairy cakes, she always used to decorate them with those canided lemon and orange slices. They were always a highlight of going round ot visit. Lemon Drizzle! It was always a tradition that my Mum would bake this every new years day!